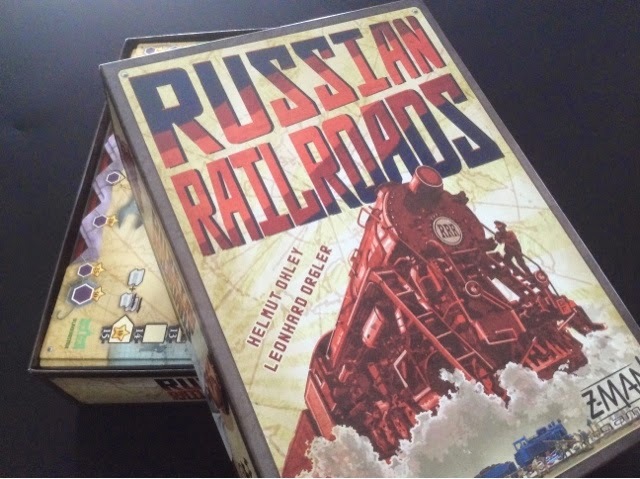 Ah, Russian Railroads... Eric's ( surprisingly ) favorite game. His design for the insert is AMAZING. I shall let the pictures speak for themselves. Manliness, Sailing, Racing, Outfoxing, Tiring... Eric's Back! And in typical gamer fashion, what other welcome would be more appropriate than a gaming Saturday! Much was played so let's not waste time on formalities! Everyone else was late - that's how much they missed Eric, haha - so we got in a 2 player game of Dungeon of Mandom. It's been awhile since I played Mandom, much of my filler time has gone to Donburiko. I've never played it 2 player before and I must say it works perfectly fine with 2. It's a simple you or me to the death and bluffing is much more evident with 2. I came out on top with back to back successes in the dungeon. He who dares wins! Ah Horse Fever, it's been awhile since "Come on Red!" I last took you off the "Red!" shelf. Those were the "Blue Blue Blue!" days, hanging with my pals and "Just roll Yellow damn it!" having a jolly good time of Horse "Sprint White Sprint!" racing and wild bets. Not many games can "Green for the win baby!" make 3 grown men stand and shout with such "Bla Bla Bla Bla Black!!" ferocity and much joy at the movement of clay pieces "Wooooo Blue baby yeah!" down a cardboard stretch. Well, my friends were reminiscing about it during previous game sessions, and I was feeling it, so I took it out again, and man, what a reception. Haha. The last game that brought about so much emotions in them would have to be Robinson Crusoe. But this time, we weren't feeling like working our way off or around an island, we wanted to get our hands dirty in some old school - fixable and rig-able - horse racing. So off to the races we went! As the announcement of the winner for the 2014 Spiel Des Jahres awards is coming soon, Jonathan and Eric discuss and list their Top 7 previous Spiel Des Jahres winners over the years. Push Your Luck Podcast is a STUPENDOUS member of The DiceTower Network. Do check out other amazing podcasts in the network. We are also proudly sponsored by Hobbygamesmart. Do visit the website for all your board gaming needs and let them know Push Your Luck sent you! We WANT you to rate and comment about us on iTunes so we can improve and bring you WHAT you want to hear! I've been wanting to play Trieste for some time as I heard it is a very excellent 3 player game. Well, one of my main groups is usually just the 3 of us, so this was a game that I bought as soon as I saw it available at one of the online game stores. Trieste is an asymmetrical game where players take on the role of a faction with different abilities and victory conditions. The 3 factions involved are the thieves, the city guard, and the merchant. 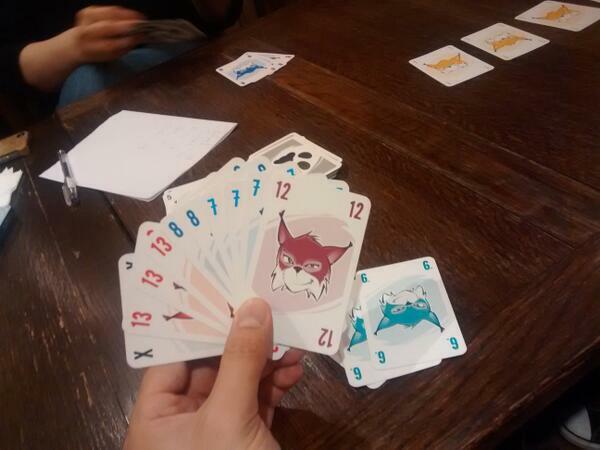 Each round is played simultaneously whereby the players will select a card from their hand to play facedown. In fixed faction order, players reveal their card, pay for the cost, and then trigger the abilities of the card. It is during this phase that most of the action takes place. Each faction is unique because of their respective card decks; thus, during the reveal phase, each faction's cards will react based on what has been played by the other factions. Anyway, I finally managed to get my hands on Sail to India recently thanks to AEG picking up the game, so I was much eager to give it a go after hearing many good reviews on it. I have decided to pursue my passion and will be starting my Masters program in Game Design at NYU this fall. Gaming is something that I love, and I have met and made so many friends ever since I began playing boardgames and started my podcast with my friend. I hope to be able to contribute back to the tabletop gaming hobby using the knowledge and network I will gain from my program. Tuition and living expenses will unfortunately be quite challenging for my wife and me because our student lives will be overlapping for a bit until she finds employment. As such, to raise funds, I am auctioning off my collection of boardgames. Any help is much appreciated so if you, please bid generously on the items listed! If you want to contribute in some other way, do geek mail me. My wife and I are very grateful for all your help! Wildcatters is something that I have never heard before until a friend brought it to a meetup and I signed up for it. I saw that it was a 2 hourish economic type of game and relatively new (Essen 2013) and decided to give it a go based on those information, hoping that it will be fun. In some ways it was and I am interested to try it again just to see if it will stick with me like Brass did. Wildcatters is a medium-heavy economic game by first time designers where players are playing 1 of 4 oil companies trying to get enough oil and ship them strategically to different refineries, aiming to score majorities in regions, shares of each company held and money. There will be a minor scoring somewhere in 3/5 of the game as well as a major scoring at the end. Player with the most points will win the game. 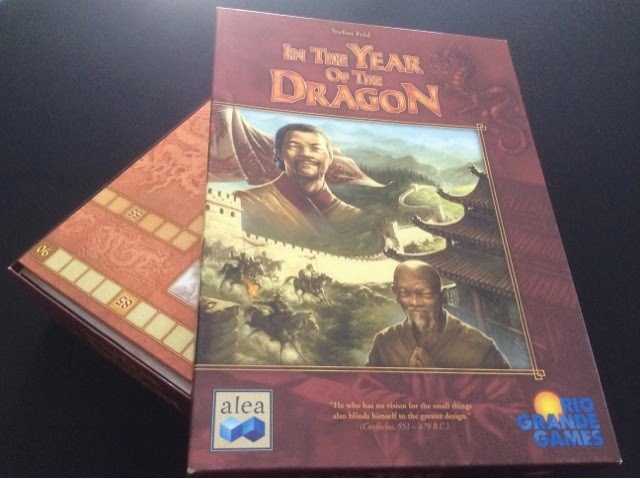 Carrying on with my craze for custom inserts is another one for an Alea game - In the Year of the Dragon. Eric Martin had been raving about Abluxxen for some time now and I was fortunate enough that even though it is in german, a few of the London gamers had already gotten a copy and I have played it a few times now. Abluxxen, designed by the famous pair of Kiesling and Kramer who brought you other games like their recent release, Coal Baron, is a set collecting style card game for 2-5 players and can be played as fast as 25 minutes. I will not go into the rules of the games but go straight into my thoughts about the game. Component wise it is just cards. You could feasibly combine 2 sets of poker decks and have your own version of Abluxxen. That said, the box is a whee bit too big for just cards. Rules wise, this can be a little tricky to get into. Mostly because the flow of the game may not be intuitive. When I first learnt it, I had one or two rules wrongly taught. When I tried to teach it, there was a player who just did not get the game even though we played about 2 rounds and others were helping him. The key point to explain will be whatever you play, you will always need to look at what others have played; if someone has the same number of cards as you just played, then you need to look at the number on the card to see if they are impacted. But when you are explaining number of cards and number ON the cards, using "numbers" may become confusing for some. Game length wise, it is usually about 30 minutes. People can start to overthink a bit but rarely does it stretch beyond 30 minutes. Some people do play a few times with the player being first to reach X points winning the game. I think if you set the goal of 40 points, that will translate to roughly 2-3 rounds. Replayability is very high because of what other players will do and the strategy you want to use. Do you want to just finish up your hand as fast as you can so you can cause your opponents to get loads of negative points OR do you want to grab as many cards as you can to have a big score at the end of the round? The biggest so far I have seen is 29 points in 1 round which was quite amazing to us (prior to this usually we are scoring 15-20 points per round). Furthermore, this game gets better with experienced players as they start to remember what you have played and try to form sets to sabotage you or just to grab your cards for themselves. I have already started to see standard strategies from my various plays. Usually the first few rounds, players will play a single "1" card in hopes that others will be forced to grab their card and they can grab nicer cards from the middle. Players sometimes also wait for a few same number cards to be played before playing a higher one to grab all of them to form a bigger set. For a simple card game, it is quite cool to watch all these strategies develop. There are many games that often do not live up to the hype but Abluxxen for me did. It plays fast, is fun, can be quite thinky. I think it works best with 4 or 5 but I have not tried the 2 player variant. Only downside I can think of is the card that indicates who is the active player. More often than not people will forget to pass it along and it can be tedious to do so. Someone replaced it with a small cat figurine and I think that works best as its easy to grab off the table. Abluxxen will not appeal to everyone (indeed I have heard some people thinking its just average) but so far I have not met anyone that think it is a dud. Push Your Luck Podcast Episode 39: Its June its June! OMG where has the time flown! Its June and half a year has gone. Eric and Jon talk about a few games they have played. In other exciting news, Eric will be starting school at NYU in Fall this year. As part of his fund raising efforts, Eric will be selling most of his board game collection on boardgamegeek. More information will be available in the next episode! Follow him on twitter @duckizz to be updated as well. Games we talk about - Tortuga, Port Royal, Traders of Carthage, Sanssouci, That’s Life and Dungeon Dice. Over the weekend, I managed to get in a play of Camel Cup! Or Camel Up! Seriously, the cover is so deceiving that it could be either. Who knows! I'm calling it Camel Up for this session report. Anyway, I only bought Camel Up because it was nominated for the 2014 Spiel Des Jahres award. As of late I have found that the awards are spot on with what my lighter gamer group prefers. Hanabi, Dixit, Ticket to Ride have all gone well with them, so have Augustus, Splendor, Witch's Brew. So if Camel Up promises the same enjoyment for all of them, then I think it would have been a solid blind buy. I decided to take this out with my medium weight group ( just the 3 of us ) since they are the first to come over since the game arrived at my doorstep. 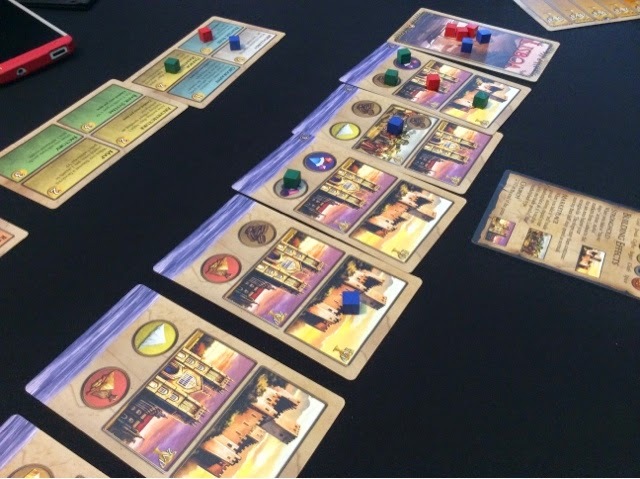 I was slightly hesitant with my decision as they do prefer medium weight thematic games - with some thinky euros every one in awhile - and I also wasn't sure what to expect with 3 players Camel Up. But well, it is new and it looks exciting and I will probably need to talk about it on the podcast! So it was a quick teaching session and off to the races we went! It seems like I can never go more than 2 game sessions without playing Hanabi. Not by choice I must say, more like, everybody else wants to play it. I've played it so often now that I am almost tired of it. Haha.